Nowadays it is possible to send pictures, images, and tweets through the internet without any superimposition of data from one source or the other. This article describes the techniques that make this sort of data transfer a possible reality. For example, if you send a message or email from your PC to your friend who resides in a different city, then your mail joins enroute with your neighborhood and other mails as well. After being clubbed together with other mails, your mail is fed into a larger transmission line, and then joined with other mails from your city. How do all these mails get joined together and transmitted without getting mixed up? This process is done by a technique called Multiplexing. Multiplexing combines multiple analog or digital signals bound for transmission through a single communication line or computer channel. This technique has been introduced to increase channel utilization in multicomputer communication systems and time sharing systems and also to reduce the communication cost. In the 20th century, many telephone companies used frequency-division multiplexing for long distance connections to multiplex thousands of voice signals through a coaxial cable system. For shorter distances, cheaper balanced cables were used for various systems like bell systems K-and N-carrier, but they didn’t allow large bandwidths. The FDM is an analog multiplexing that combines analog signals. Frequency division multiplexing is applied when the bandwidth of the link is greater than the combined bandwidth of the signals to be transmitted. In this type of multiplexing, signals are generated by sending different device-modulated carrier frequencies, and these modulated signals are then combined into a single signal that can be transported by the link. To accommodate the modulated signal, the carrier frequencies are separated with enough bandwidth, and these bandwidth ranges are the channels through which different signals travel. These channels can be separated by unused bandwidth. Some of the examples for the time division multiplexing include radio and television signal transmission. Wavelength division multiplexing (WDM) is a technology in fiber optic communications; and, for the high capacity communication systems, wavelength division multiplexing is the most promising concept. This system uses multiplexer at transmitter to join signals and demultiplexer to split the signals apart, at the receiver end. The purpose of WDM is to combine multiple light sources into a single light source at the multiplexer; and, at the demultiplexer the single light is converted into multiple light sources. WDM is designed to use the high data rate capability of the fiber optic cable. The data rate of this cable is higher than the metallic transmission cable’s data rate. Conceptually, the wavelength division multiplexing is same as the frequency division multiplexing, except for the transmission through the fiber optic channels wherein the multiplexing and demultiplexing involves optical signals. Time division multiplexing is a technique used to transmit a signal over a single communication channel by dividing the time frame into slots – one slot for each message signal. Time-division multiplexing is primarily applied to digital signals as well as analog signals, wherein several low speed channels are multiplexed into high-speed channels for transmission. Based on the time, each low-speed channel is allocated to a specific position, where it works in synchronized mode. At both the ends, i.e., the multiplexer and demultiplexer are timely synchronized and simultaneously switched to the next channel. Synchronous time division multiplexing can be used for both analog and digital signals. In synchronous TDM, the connection of input is connected to a frame. 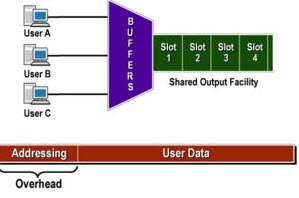 If there are ‘n’ connections, then a frame is divided into ‘n’ time slots – and, for each unit, one slot is allocated – one for each input line. In this synchronous TDM sampling, the rate is same for all the signals, and this sampling requires a common clock signal at both the sender and receiver end. In synchronous TDM, the multiplexer allocates the same slot to each device at all times. In asynchronous time-division multiplexing, the sampling rate is different for different signals, and it doesn’t require a common clock. If the devices have nothing to transmit, then their time slot is allocated to another device. Designing of a commutator or de-commutator is difficult and the bandwidth is less for time-division multiplexing. This type of time-division multiplexing is used in asynchronous transfer mode networks. Time-division multiplexing can be visualized as two fast rotating switches on the multiplexing and demultiplexing side. At the same speed these switches rotate and synchronize, but in opposite directions. When the switch opens at the multiplexer side in front of a connection, it has the opportunity to send a unit into the path. In the same way, when the switch opens on the demultiplexer side in front of a connection that has the opportunity to receive a unit from the path. This process is called interleaving. Statistical time-division multiplexing is used to transmit several types of data concurrently across a single transmission cable. This is often used for managing data being transmitted via LAN or WAN. The data is simultaneously transmitted from the input devices that are connected to the network including printers, fax machines, and computers. This type of multiplexing is also used in telephone switch board settings to manage the calls. Statistical TDM is similar to dynamic bandwidth allocation, an in this type of time-division multiplexing, a communication channel is divided into an arbitrary number of data streams. These are the different types of multiplexing techniques used in communication system for efficient transferring and receiving of the data. Hope you have got a better idea of all these types of multiplexing, and therefore, you can share your views on this article in the comment section below. 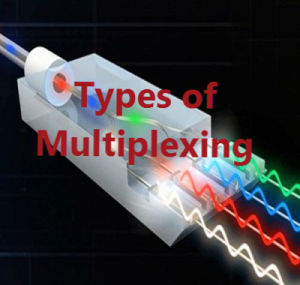 And, also mention any of the practical examples of these multiplexing types – if you are interested. Thanks for post this kind of information. thanks.. for clear theory..and to the point concept..